This 2-day interactive workshop is focused on learning and practicing communication skills and strategies to increase motivation of clients and success in achieving lasting behavior change. · Strengthen fundamental skills of empathetic communication. · Deepen ability to recognize, elicit, and respond to change talk. This is a 2 days 14-hour workshop that will provide an introduction to the clinical method as well as its theoretical and research base. The training is primarily focused on discussion and application of the “Spirit and Processes” of MI. The Spirit can be described as the cornerstone for MI practice and, when embraced, will influence the relationship and approach participants have with their clients. This training is sponsored by Daymark Recovery Services and is held in High Point, NC. 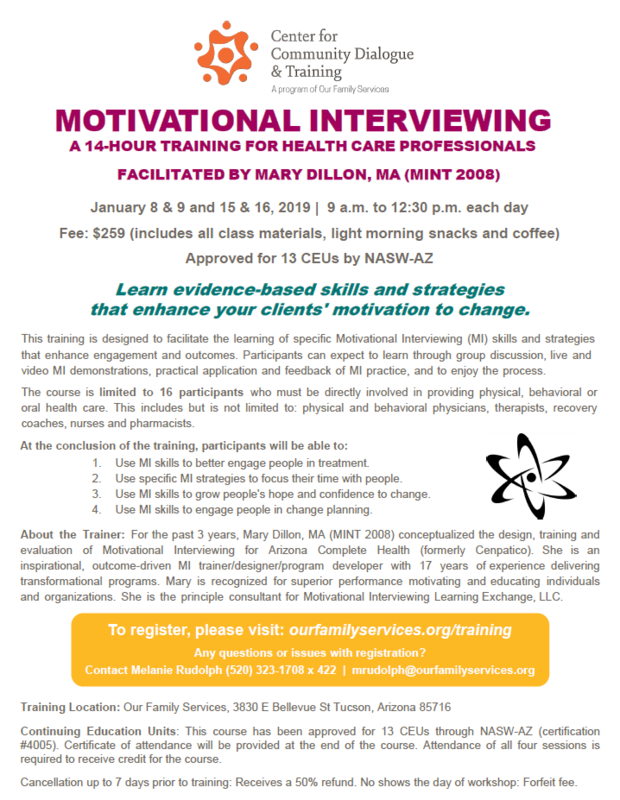 This training is designed to facilitate the learning of specific Motivational Interviewing (MI) skills and strategies that enhance engagement and outcomes. Participants can expect to learn through group discussion, live and video MI demonstrations, practical application and feedback of MI practice, and to enjoy the process.